Water from a household tap, a borehole or well, or rainfall will have unique properties and individual chemistry influenced by the location. No two ponds are identical in respect of their water chemistry or biology and many factors will naturally differ. It is not surprising that, the solution to a water chemistry issue that arises in one pond could make matters worse in another. A genuine knowledge of water science requires study at a molecular level, and an understanding of the role of water in Koi physiology and welfare is also needed to be able to offer advice .However, this is not essential for those hobbyists whose goal is simply to provide perfect pond conditions that will support their Koi for life. Measuring the pH of pond water tells us the hydrogen ion concentration, a value below 7 is acidic and above 7 is alkaline. Koi are capable of making adjustments internally in order to live in pond water with a pH between 7 and 9 although values over 8.5 may need monitoring to ensure they are stable. 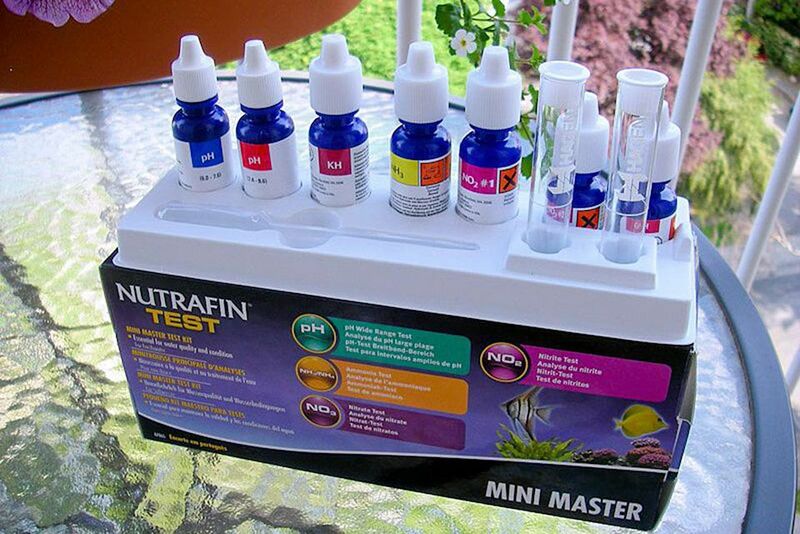 The optimum pH for Koi health, growth, and longevity is 7.5 - 8.0. This value is based on research carried out in UK water in my facilities with thousands of Koi for over 30 years. However, ideal conditions may well vary depending on the objective. For example , a Koi keeper may find his water chemistry supports the well-being of his Koi, although it does not preserve the highly prized red colour cells in some of his Koi varieties. Whilst genetics is the major influence, water chemistry has a minor role in colour retention. The pH in a Koi pond must be stable and this means all the changes that occur should be natural and therefore gradual. Water temperature, daylight length, the seasons, as well as the weather can all trigger chemical reactions and Koi have to adapt or they become unwell. Most hobbyists will have seen a Koi in the early morning suddenly dart across the pond surface on one side while adjusting to the new conditions. Some Koi are more sensitive and not all will react in the same way. If a pond with a normally stable pH suddenly alters it will upset the Koi and they may become listless and stop feeding. A more serious impact on their well-being is likely if the pH is in a state of continual fluctuation. If the pH alters, by more than 0.2 most Koi will release stress hormones as they attempt to adjust to the changes and having to adapt for long periods puts their survival at risk if the pH is not quickly stabilised. Although KH and pH have to be tested separately to assess how the pH is supported, they are closely associated, as it is by testing KH that the buffering capacity of the pH is revealed. It simplifies water chemistry to state that the pH will always remain stable if the KH level is in excess of 85 - 90 mg/L. At that level, fluctuations are far less likely but we have to keep in mind that pond water is less stable than tap water due to the numerous influences on it, particularly the pond filter system. In ponds, the pH can crash whereas that is not an issue in tap water as it is prepared and monitored by the water suppliers. There are many anomalies in respect of KH as the levels vary around the UK. In some areas, a KH of 1.0 does not always trigger an immediate pH crash. The Koi could remain safe until a pond event takes place such as the introduction of a treatment product. It is possible that as the product goes into solution it will interfere with the delicate knife-edge chemistry that has kept the koi alive until the inevitable crash. Some of the ways in which koi can be protected from a pH fluctuation or crash are listed below. K H buffering with bicarbonate of soda: The KH level of a pond can be raised by adding sodium bicarbonate at 100 gms in 1,000 gallons daily until the level is stable. The drawback with this method is that if there is an unknown reason as to why the pH decreased or crashed , sodium bicarbonate may not hold the level and it will drop yet again. This then adds to the fluctuations the Koi experience and avoiding fluctuations protects the Koi. If daily doses are needed, the Koi keeper can never forget to buffer let alone take a holiday and in such cases, this cannot be seen as an ideal solution. Many buffering products on sale in aquatic outlets are also based on sodium bicarbonate. Source: Paula Reynolds, Bsc, PhD,BA - Paula an aquatic patho-biologist, runs Lincolnshire Fish Health Laboratories and Research Centre a company that specialises in research into fish diseases for vets, fish farmers, hobbyists and the aquatic trade in England.